The online phantom player ‘Isildur1‘ who has been creating a stir within the high stakes online poker scene at Full Tilt Poker has once again managed to get his name into the media spotlight, even though this time he’s not actually caused the attention himself. With the announcement that Party Poker are set to host Big Game IV, Tony G who heads up the Party Poker professional player roster has spoken out on the sites blog to tell ‘Isildur1‘ that he wants to see the online unknown enter into the tournament, so much so that the professional has even said that he would pay everything for the player to attend the game. Tony G said in his blog post that he was willing to pay for flights, hotel and stake the player into the game as long as he would agree to feature within the game, a deal that might bring the player out of the shadows and into the sight of the players within the tournament. Although the call has been made to draw the player out of the shadows, its been noted that should the player want to attend but still maintain his identity, the company would ensure that they did everything within their power to do so. With this statement been issues will we finally get to see the real ‘Isildur1‘ in live action or will the player ignore the call out and stay within the dark corners of the internet where he seems to be doing so well. The organisers are still awaiting an answer from the online poker player and are so far reserving a seat at the tournament for the online mystery player but with some of the games biggest names queuing up to fill the seat, surely the offer isn’t going to stand for too much longer? 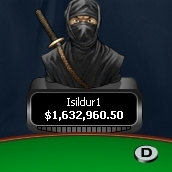 Stay tuned with us to see how ‘Isildur1‘ decides to address the call out. This entry was posted on Friday, March 26th, 2010 at 8:55 am and is filed under Poker News. You can follow any responses to this entry through the RSS 2.0 feed. You can leave a response, or trackback from your own site.